Get Your CRN Banner Here, and wins some CRN Prizes! HOW TO GET A LINK FOR YOUR WEBSITE AND GRAB SOME PRIZES! First, look at the banners below to see which one works best with your website, then click on that banner. You will then be taken to the page that will provide the HTML formula to insert in your page. Then e-mail us with the site’s name and the location of our banner then your name will automatically be entered for your chance to win. If you are having problems, please feel free to e-mail our support department. 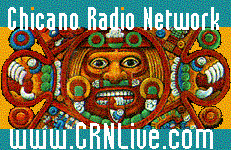 Thank you for supporting The Chicano Radio Network since 1995! The Crossroads of Latino Music from Around the World!